In this 3 days/ 2 nights Jaisalmer trip from Delhi, we offer return flight tickets for Delhi-Jaisalmer. The tour details are mentioned below & you can reach us +91 9782585460 for more details. You will catch the 8:35 am flight from Delhi Airport, which arrives at Jaisalmer by 10:05 pm. From Airport, our driver will pick & drop you at the booked hotel, where you can rest for an hour or 2. 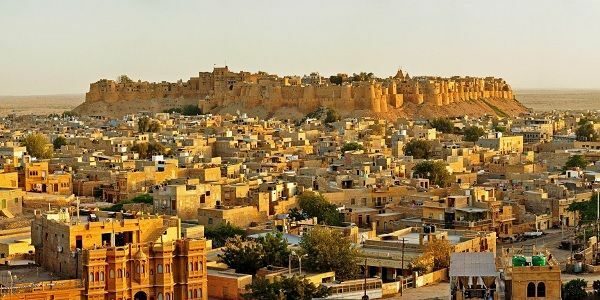 Your voyage in Jaisalmer will start with a trip to the famous Jaisalmer Fort by noon or 1 pm. Here you will visit many mansions, temples & also enjoy a free walk in the Jaisalmer markets. 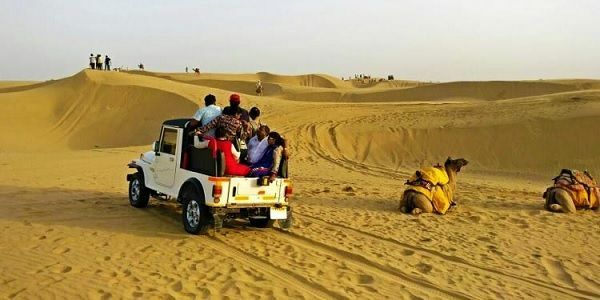 By 4 pm, you will visit the sand dunes of Sam, 45 km from Jaisalmer, to enjoy Camel or Jeep Safari tour, visit the desert sunset point, enjoy a musical program with buffet dinner at a desert camp & come back to Jaisalmer city by 11 pm. Day 2: Jaisalmer city & desert sightseeing. After your breakfast at the hotel, you’ll start the today’s tour with a trip to Jaisalmer War Museum, which is 10-20 km outside Jaisalmer. Later you’ll visit popular sites near Jaisalmer (names mentioned below) & by evening, a tour of Gadsisar lake & attend NK Sharma Puppet show. After an early breakfast, you’ll check-out from the hotel & we’ll drop you at Jaisalmer Airport before 9 am, to catch the 10:35 am flight for Delhi. Visit Sunset point at dunes. And back at the hotel in city by 11 pm. Apart from the last 2 tourist attractions, all other sites are near Jaisalmer city, in the desert area and are some of the must see planes in our Jaisalmer Sightseeing tour.